“Fury on the Fourth” in Giddings This Weekend! 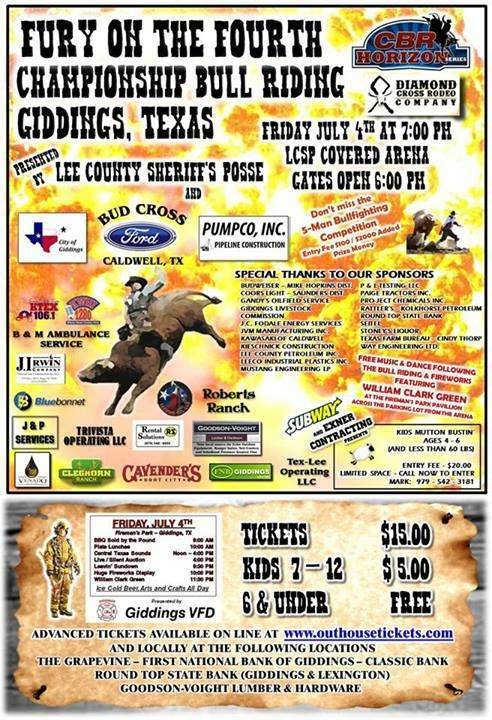 Kick off your Fourth of July Weekend in Giddings, Texas at the Lee County Sheriff’s Posse “Fury on the Fourth” this Friday night! A seven o’clock start time will light the fuse on CBR Bull Riding and Freestyle Bullfights. Don’t miss out on this great event! Advanced tickets available online at Outhouse Tickets and at the local locations listed in the poster below! This entry was posted in Diamond Cross Rodeo. Bookmark the permalink.